Slazenger became the largest manufacturer of tennis balls in the world. Ralph Slazenger (1844 – 1910) was born in Warrington to a family of German Jewish origin. He attended Manchester Grammar School and Forster’s College in Cheetham before joining the family firm of tailors in Manchester. The Slazenger & Sons name was introduced from 1876. Athletic clothing was produced from 1877. Ralph and his brother Albert Slazenger (1857 – 1940) transferred the family firm from Manchester to 56 Cannon Street, London in 1879. The firm began to produce sporting equipment from around this time. Following the move to London, Ralph Slazenger renounced his Judaism and converted to the Anglican faith. Slazenger tennis balls were used at the largest tournaments in England and Scotland by 1888. British businesses controlled practically all of the European tennis equipment market by 1889. Ralph Slazenger retired in 1901, leaving sole control of the firm with his brother. The Slazenger lawn tennis ball became the official ball of the Wimbledon Tennis Tournament from 1902. The association continues to this day, and is the longest continually-running sporting sponsorship in the world. Archdale Palmer (1865 – 1950), secretary of the All England Club, Wimbledon, was appointed general manager (equivalent to managing director) of Slazenger from 1905. The Wimbledon tennis tournament was won with Slazenger rackets 16 times between 1890 and 1910. Ralph Slazenger was an extremely popular and likeable man. He was a keen contributor to many charitable organisations. He died in 1910, and his gross estate was valued at £56,137. Slazenger & Sons was registered as a public company, Slazengers Limited, in 1911. It had a capital of £265,000. It was the largest manufacturer of lawn tennis balls in the world. A factory was established in Australia in 1922. A factory was established in Toronto, Canada in 1924. Dunlop Rubber, another large manufacturer of sporting goods, discussed a possible takeover of Slazenger in 1927, but ultimately nothing came of it. H Gradidge & Sons, cricket bat manufacturer of Woolwich, was acquired in 1931. Fred Perry (1909 – 1995) exclusively used Slazenger rackets throughout his career, and was sponsored by the company from 1935. A factory had been established in France by 1935. The Slazenger factory at Woolwich was the largest tennis ball producer in the world by 1936. Slazenger was the leading tennis racket manufacturer in the world by 1937. Slazenger established a factory at Hurstpierpoint, West Sussex in 1939. Albert Slazenger died in 1940. His estate was valued at £444,263, and the bulk of it went to his son, Ralph Chivas Gully Slazenger (1914 – 2006). Archdale Palmer succeeded him as company chairman. During the Second World War almost all production was dedicated towards producing goods for the war effort. However much of the London production facilities were destroyed during the Blitz. Alternative factories had to be found quickly to fulfil existing war contracts. To gain factories quickly, Slazenger acquired William Sykes Ltd, a cricket bat manufacturer with a site at Horbury near Wakefield, and a controlling interest in Ayres Sports Goods Ltd in 1942. A former war factory at Barnsley was also acquired in 1945, to establish a manufacturing centre for tennis balls. After the war the Horbury site was modernised and extended. Slazenger closed its London factories in 1946 and concentrated production at Horbury, with 700 employees, and Barnsley, with a workforce of 200. As Barnsley had not yet reached full production, it was announced that a further 600 people would be employed. W S Dunning, the managing director of Slazengers, proclaimed that, “Yorkshire will soon be producing the bulk of the world’s sports equipment in the world’s most up-to-date plant”. A significant proportion of production was exported by the 1950s. Slazenger was acquired by Dunlop Rubber in an exchange of shares which valued the company at over £1.35 million in 1959. Carlton Sports of Saffron Walden, Essex was acquired in the 1960s. 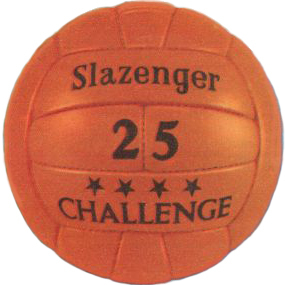 The footballs for the World Cup finals in 1966 were made by Slazenger at Horbury. The Slazenger ball was chosen amidst competition from eight other manufacturers. Horbury was the largest factory of its type in Europe by 1983. However, manufacturing at Horbury ended in the late 1980s. Dunlop Slazenger was sold to its management for £300 million in 1996. It was the leading producer of tennis balls in the world, and employed 3,000 people. The Dunlop Slazenger golf division factory at Normanton, near Wakefield, was closed in 2000 with the loss of 69 jobs. Production was relocated to the United States. The Barnsley factory was closed in 2002 with the loss of 134 jobs. Production was relocated to Bataan in the Philippines, with a location closer to the source of rubber, and also lower labour costs. The felt coating for the balls is produced in Stroud, Gloucestershire, using imported New Zealand wool. Sports Direct acquired Dunlop Slazenger for £35-40 million in 2004.